Aided by the convenience and constant access provided by mobile devices, especially smartphones, 92% of teens report going online daily — including 24% who say they go online “almost constantly,” according to a new study from Pew Research Center. More than half (56%) of teens — defined in this report as those ages 13 to 17 — go online several times a day, and 12% report once-a-day use. Just 6% of teens report going online weekly, and 2% go online less often. African-American and Hispanic youth report more frequent internet use than white teens. Among African-American teens, 34% report going online “almost constantly” as do 32% of Hispanic teens, while 19% of white teens go online that often. Facebook remains the most used social media site among American teens ages 13 to 17 with 71% of all teens using the site, even as half of teens use Instagram and four-in-ten use Snapchat. 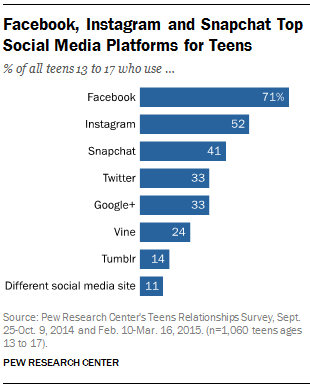 Teens are diversifying their social network site use. A majority of teens — 71% — report using more than one social network site out of the seven platform options they were asked about. Among the 22% of teens who only use one site, 66% use Facebook, 13% use Google+, 13% use Instagram and 3% use Snapchat. This study uses a somewhat different method than Pew Research Center’s previous reports on teens. While both are probability-based, nationally representative samples of American teens, the current survey was administered online, while our previous work involved surveying teens by phone. A great deal of previous research has found that the mode of interview — telephone vs. online self-administration — can affect the results. The magnitude and direction of these effects are difficult to predict, though for most kinds of questions, the fundamental conclusions one would draw from the data will be similar regardless of mode. Accordingly, we will not compare specific percentages from previous research with results from the current survey. But we believe that the broad contours and patterns evident in this web-based survey are comparable to those seen in previous telephone surveys. Facebook remains a dominant force in teens’ social media ecosystems, even as Instagram and Snapchat have risen into a prominent role in teens’ online lives. 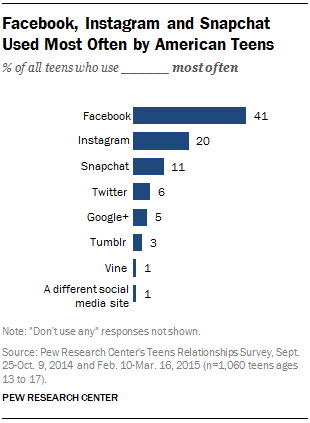 Asked which platforms they used most often, the overall population of teens in this sample (ages 13 to 17) reported that Facebook was the site they used most frequently (41% said that), followed by Instagram (20%) and Snapchat (11%). Boys are more likely than girls to report that they visit Facebook most often (45% of boys vs. 36% of girls). Girls are more likely than boys to say they use Instagram (23% of girls vs. 17% of boys) and Tumblr (6% of girls compared with less than 1% of boys). Older teens ages 15 to 17 are more likely than younger teens to cite Facebook (44% vs. 35% of younger teens), Snapchat (13% vs. 8%) and Twitter (8% vs. 3%) as a most often used platform, while younger teens ages 13 to 14 are more likely than their older compatriots to list Instagram (25% vs. 17% of older teens) as a platform they visit most often. The survey data reveals a distinct pattern in social media use by socio-economic status. Teens from less well-off households (those earning less than $50,000) are more likely than others to say they use Facebook the most: 49% of these teens say they use it most often, compared with 37% of teens from somewhat wealthier families (those earning $50,000 or more). Teens from more affluent households are somewhat more likely than those from the least affluent homes to say they visit Snapchat most often, with 14% of those from families earning more than $75,000 saying Snapchat is their top site, compared with 7% of those whose families earn less than $30,000 annually. Twitter shows a similar pattern by income, with the wealthiest teens using Twitter more than their least well-to-do peers. It should be noted that some of these differences may be artifacts of differences in use of these sites by these different subgroups of teens. And teens are not simply sending messages through the texting system that telephone companies offer. Some 73% of teens have access to smartphones and among them messaging apps like Kik or WhatsApp have caught on. Fully 33% of teens with phones have such apps. And Hispanic and African-American youth with phones are substantially more likely to use messaging apps, with 46% of Hispanic and 47% of African-American teens using a messaging app compared with 24% of white teens. Teenage girls use social media sites and platforms — particularly visually-oriented ones — for sharing more than their male counterparts do. 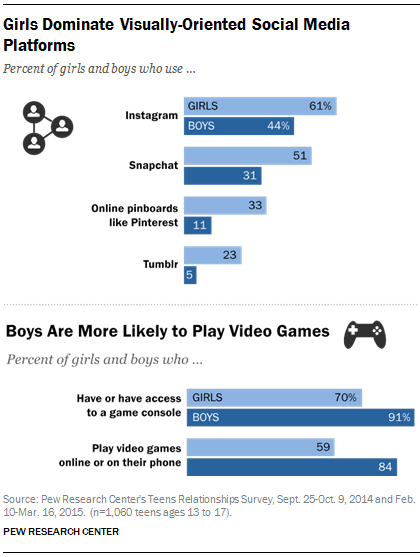 For their part, boys are more likely than girls to own gaming consoles and play video games. Data for this report was collected for Pew Research Center. The survey was administered online by the GfK Group using its KnowledgePanel, in English and Spanish, to a nationally representative sample of over 1,060 teens ages 13 to 17 and a parent or guardian from September 25 to October 9, 2014 and February 10 to March 16, 2015. In the fall, 1016 parent-teen pairs were interviewed. The survey was re-opened in the spring and 44 pairs were added to the sample. For more on the methods for this study, please visit the Methods section at the end of this report.